Château de Beaucastel has long been considered one of the great wines of France. It is unanimously renowned for its balance, elegance and ageing potential. Beaucastel has an extraordinary terroir at the Northern end of the appellation with heavy exposure to the Mistral. All 13 varieties of the appellation have been organically grown here since the sixties. Châteauneuf du Pape, between Orange and Avignon, Château de Beaucastel red is a 70-hectare vineyard. Château de Beaucastel is 110 hectares, with one single plot at the north of the appellation. The terroir is archetypal of the best terroirs in Châteauneuf: rolled pebbles on the surface, sand, clay and limestone deeper down. The vines are old and have been organically grown for 50 years, which has allowed the roots to grow exceptionally deep. Beaucastel grows all thirteen grape varieties authorised by the appellation. Each variety is harvested manually and separately. Vinification is completed in truncated oak barrels for the reductive grapes (Mourvèdre and Syrah) and in traditional tiled cement tanks for the oxidative grapes (such as Grenache). After the malolactic fermentations, the family blends the different varieties and then the wine ages in oak Foudres for a year before being bottled. A subtle nose, very elegant with notes of mushrooms, roasted coffee, citrus fruit and anise. The mouth is soft and acidic without any astringency. Very nice sweet tannins and good length. 15°C and if possible decant before serving. This wine is ready to drink and must be decanted several hours before serving. Stand the bottle upright 48 hours before serving to avoid any deposit. The cherry, licorice and black pepper flavors are true to form, but dominated by firm tannins at this stage. Well made and should show better in 1997. 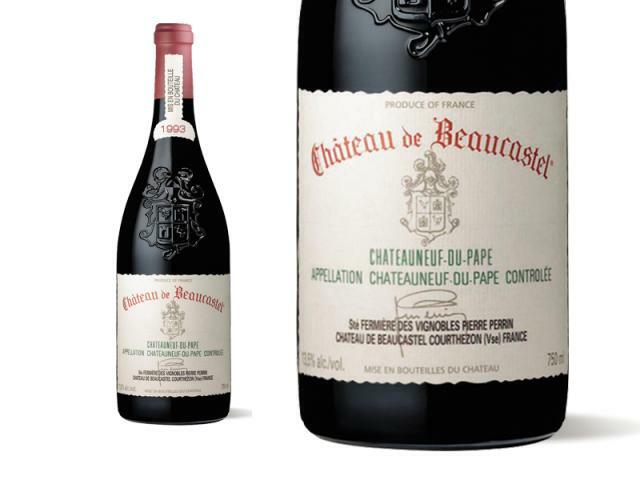 When I tasted the 1993 Beaucastel in Chateauneuf du Pape, the wine was far more showy, flashy, and open-knit than bottles tasted state-side, admittedly right after reaching these shores. I backed off my initial high rating a bit and added the question mark because of how tannic, backward, and firm the wine showed on two separate occasions from a case I purchased. It certainly possesses the dense color I described in my original review (issue #101), as well as plenty of body and intensity. However, the rich, sweet, open-knit bouquet has gone into hibernation, leaving a tightly-knit wine that is frozen in place, reluctantly offering up aromas of black fruits and smoke. Tannic, austere, and more in step with the 1988, this appears to be a vintage that will require more initial cellaring than I had anticipated. It will be interesting to re-taste this wine after it has had 4-6 months of rest on these shores.